Alice Walker (right) talks with Emory University Librarian Yolanda Cooper in the Rose Library. 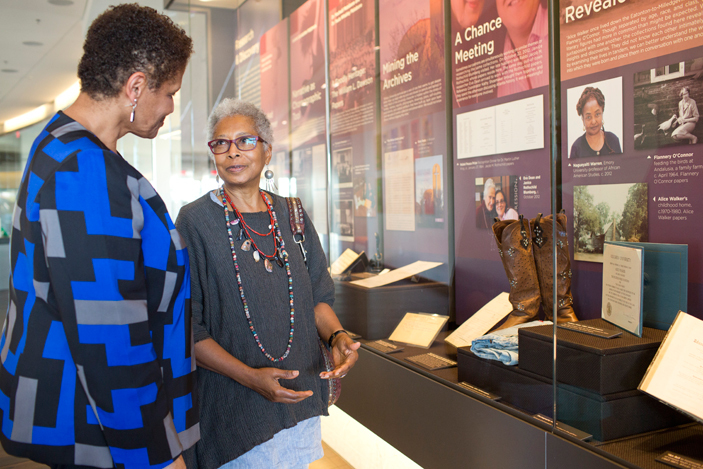 Her activist "uniform" of jeans and boots, as well as her Pulitzer Prize, can be seen in the display case. 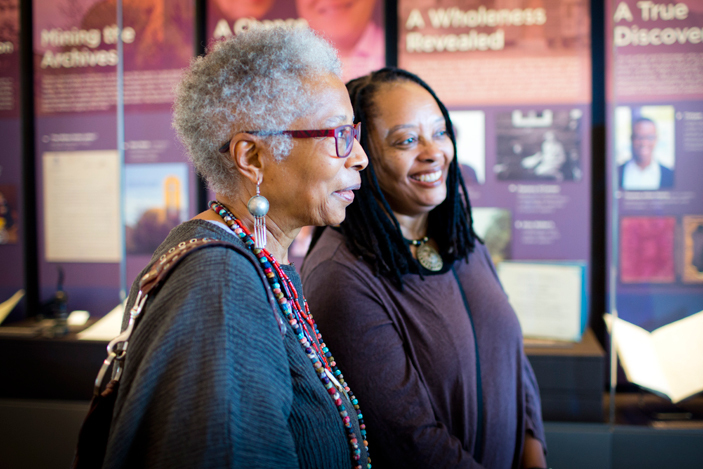 Alice Walker views displays in the renovated Rose Library with UGA professor Valerie Boyd (right), who is editing Walker's journals for publication. 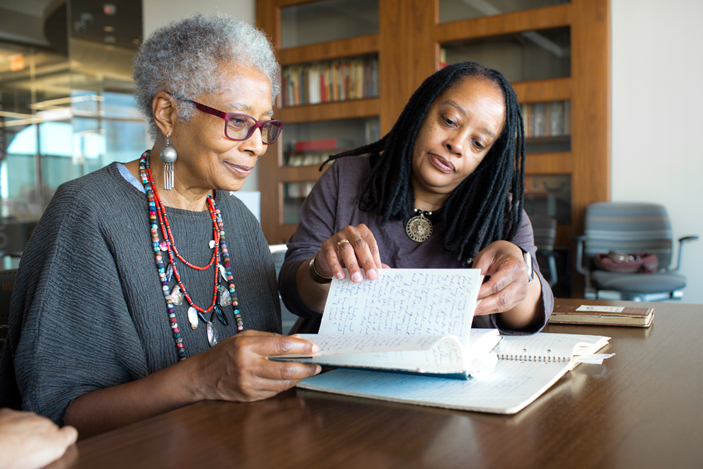 Alice Walker and Valerie Boyd look through Walker's handwritten journals, part of the Pulitzer-winning author's archives at Emory. Walker placed her archives with Emory in 2007. Alice Walker describes viewing her archives at Emory as "like visiting with a part of myself that I've been missing." "Journals sometimes save your life," Alice Walker explains. 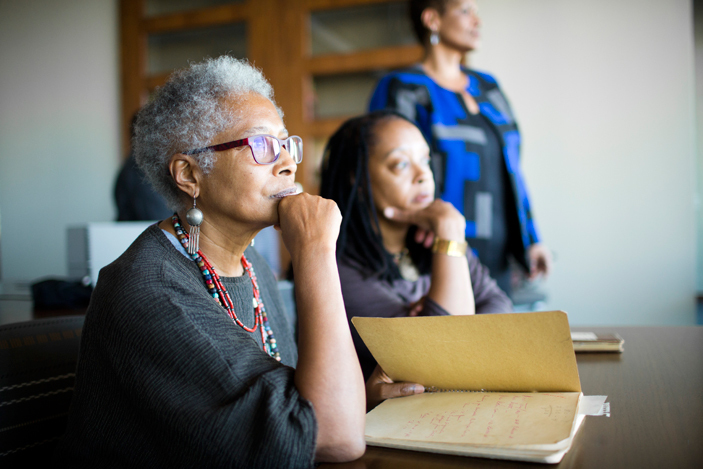 Emory has been the home for Alice Walker's archives since 2007. Last week, the acclaimed writer visited the archives to work with Valerie Boyd, the scholar who is editing her journals. 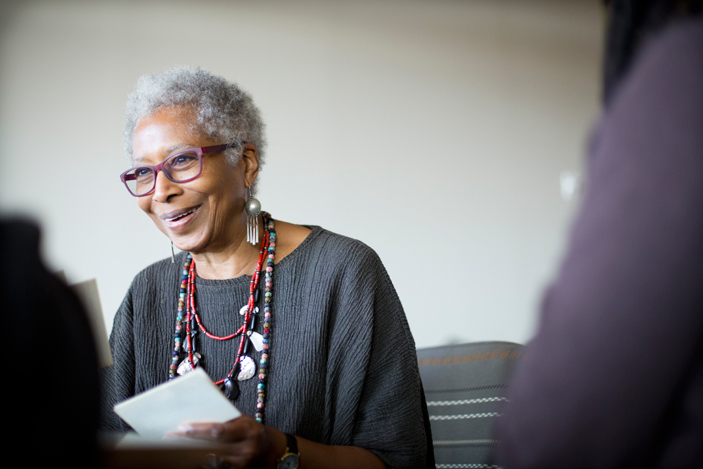 "Journals sometimes save our lives," Alice Walker mused as she paged through handwritten volumes of her reflections, enjoying a visit of sorts with her former self as she prepares to give those words to the world. The Georgia-born, Pulitzer Prize-winning writer came to Emory's Stuart A. Rose Manuscript, Archives and Rare Book Library last week to work with scholar Valerie Boyd, who is editing her journals for publication. "We want to once again look at the journals together, and I just like to see them," Walker explained as she arrived at the Rose Library on Friday evening. "They are my memories." In 1983, Walker became the first African American woman to win the Pulitzer Prize for Fiction, celebrating her novel "The Color Purple." An acclaimed novelist, essayist, poet and short story writer, she placed her archives at Emory in 2007, including drafts of all of her manuscripts, photographs, journals and memorabilia from her life. While most of Walker's archive has been available to students and researchers for years, her journals — some 65 volumes spanning 50 years — are embargoed until her death, or until 2027, should she die earlier. Yet readers will get a first look at these writings in 2017, when 37 Ink/Simon & Schuster publishes "Gathering Blossoms Under Fire: The Journals of Alice Walker," curated and edited by Boyd with commentary from Walker. Boyd, a journalism professor and Charlayne Hunter-Gault Distinguished Writer in Residence at the University of Georgia, has been a steady presence at Emory as she works on the project. But this was her first visit here with Walker since the Manuscript, Archives and Rare Book Library was rededicated Oct. 1 with a new name and extensive renovations. Once a dark, closed-in space at the top of Emory's Woodruff Library, the newly-named Rose Library now features glass-walled rooms with expansive views of the Emory campus and Atlanta skyline. The wide central corridor is lined with display cases showcasing items from the library's extensive collections. Touring the space, Walker clapped in delight to see her old activist "uniform" — faded jeans and worn boots — on display with her Pulitzer Prize. "I love it. My uniform! This is wonderful," she said. "This is so cool." Boyd noted that she and Walker had last visited the archive together in 2013, in the old space. "This is such a beautiful, inspiring space to work together in," said Boyd, whose previous book, “Wrapped in Rainbows: The Life of Zora Neale Hurston,” chronicled the life of an author Walker has long admired. Before getting down to work on Saturday, Walker visited the Rose Library with Boyd late Friday, warmly greeting archivists, meeting University Librarian Yolanda Cooper and offering her thoughts on the project. Preparing to publish words she originally intended to be private feels different than publishing writing that she created for others to read, she acknowledged. "But as life goes on, you realize that few things are so private that people can't relate to them," Walker said. "And young people now are in desperate need of any information and thoughts that we can give them to help them not just die of despair. "I think they will enjoy reading the journals and I think they will find medicine for their lives. That's my hope." The overall message readers will take from her journals, she believes, is about the power of words to heal and transform. "You can write your life in a way that is curative. Part of the medicine of writing is that it helps you become a better person," Walker said. "In fact, this is one of the things that Virginia Woolf really believed — although she killed herself, which makes you think, well, I don't know – but she thought that writers actually could heal themselves and help repair the world by being writers." Boyd noted that as she has explored Walker's journals over the last two years, working with Emory PhD student Nicole Morris, she has been struck by how "anyone can find themselves in the journals at whatever point they are in their lives." "You find some glimpse of yourself through a woman living a full life and not knowing where the roads are going to lead," she said. Boyd recalled a passage in the journals from when Walker was about 25, despairing as she tried to teach herself how to write novels and wondering if she should just stick to short stories. "She didn't know she was going to become a great American novelist, so that's what’s great about the journals – it's not a memoir looking back, it's written in real time," she said. "So she is going through whatever struggles or whatever joys, and they are captured in those bright, brilliant moments in the journals." Every day, students and researchers visit the Rose Library to explore its rich literary, cultural and historical collections. Still, it is especially meaningful when those who have placed their archives at Emory return to work with those materials, according to Rosemary M. Magee, Rose Library director. "When we have an author or writer very closely connected to the materials using them for a project, it creates an ongoing collaboration," Magee said. "Like all collaborations, that involves dialogue and trust, and it's a relationship." After Salman Rushdie placed his archives at Emory, he used them extensively for research to write his memoir, "Joseph Anton," she noted. Former U.S. Poet Laureate Natasha Trethewey, Emory's Robert W. Woodruff Professor of English and Creative Writing, also actively uses her archives in the Rose Library. "To have an author actively engaged in the materials means a lot to us," Magee said. "They have entrusted us, and we are now a part of their story and they are part of ours. Our paths are interwoven. We learn from one another." For Walker, returning to her journals is a kind of homecoming, a chance to travel back in time, but with the wisdom and perspective of the present. "It's like visiting with a part of myself that I've been missing, because when I gave my journals to Emory, many of them toward the end were right in the middle, so there are empty pages," she explained. "It's like I wrote up to this page and closed it and handed it over, so there's this cliff-hanging feeling. I like to go back there and see whether I hung on or whether I dropped or what happened."